In share trading we trade the physical shares while in futures trading we trade the contracts of the physical shares. That's why in share trading without short selling, investors are always exposed to a 'naked position' of 'buy' as the initial action is always 'buy' from the brokers in the exchange. Meanwhile in futures trading, investors can sell the contracts first and then buy them after, directly from the exchange. I didn't see any troubles in the current financial turmoil with a successful futures trading. I waited for 2 days. I didn't trade on Wednesday cos I was doing something else. I knew that bad news was continuously spread by 'fellow media'. 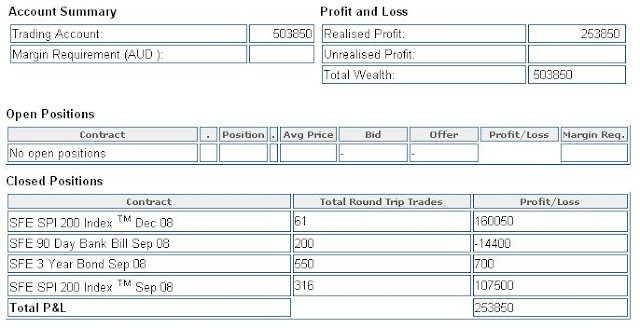 On Thursday 18 Sep 08 the price of ASX SPI 200 Dec Futures dropped to 4,616. So, by 122 points I reaped $152,500 profit. ASX SPI 200 Futures has been my favourite toy traded in Sydney Futures Exchange (SFE). The price is tight to the index of ASX SPI 200, index of 200 Australian shares. A day rally in the US market (evening in Aus) frequently influences the next trading day in the Australian market. Sometimes the profit can only be taken before midday though. ASX SPI 200 Futures trading opens 9.50 am.